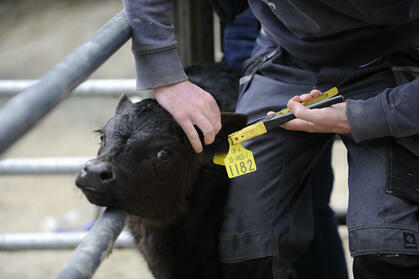 Tagging calves is carried out as part of the Bovine Animal Identification System. The aim is to guarantee the safety of beef and beef products by the operation of an effective animal identification and tracing system. When should calves be tagged? The tagging system requires the application of two identically numbered yellow plastic ear tags to calves born on a holding within 20 days of birth. 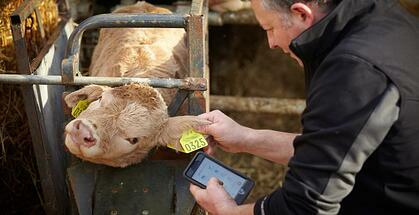 However, to avoid confusion calves should be tagged as soon as the animal is dry. Correct application of cattle tags is fundamental to any operation. Properly placed tags will minimise discomfort for the animal, decrease risk of injury to personnel and last longer in the ear. How to tag a calf? 1. Ensure the calf is securely restrained. 2. Squeeze the handles of the tagger to check that the pin slides easily into the hole on the opposite end of the tagger. 3. Place the male component of the tag on the tagger pin and the female component on the opposite side. 4. Make sure the female tag part is correctly aligned with it's male counterpart and squeeze the taggers. 5. Remove the tagger and ensure the tag halves are interlocked and placed both securely and comfortably. TOP TIP: The ideal location for a tag is in the middle one-third of the ear, between the rises in auricular cartilage. Tags placed too close to the head will fit too tightly due to the thicker cartilage, and may cause tissue necrosis. Tags placed too far towards the top or bottom of the ear are easily torn out. How do you order replacement tags? Herdwatch has partnered with all three approved cattle tag providers in Ireland, Cormac Tagging, Datamars Agri and Mullinahone Co-Op to help farmers counteract a major cross-compliance issue by allowing our members to record and order missing tags directly from the Herdwatch app on their phone. All the farmer has to do is select the missing tag numbers and place the order with their tag company of choice through the Herdwatch App. 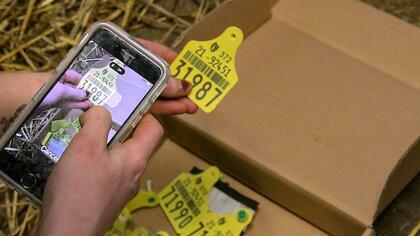 Order replacement tags on the spot with the Herdwatch App. Previous Here come the girls!